It’s Your Right and Our Fight – Register to Vote! Today is National Voter Registration Day. To commemorate this important day, all eligible voters should take the time to register to vote or to check that their current voter registration status is up to date. There are 42 days before Election Day on Tuesday, November 6, and it is not too late to register or to make changes to your registration. Honor this day by making sure your voice is heard in this upcoming election! Voting is a requirement for a healthy democracy. The decades-long struggle to ensure that every eligible person can register to vote is still being fought today. Countless measures disenfranchise voters in states and localities across the country, and registration is not as accessible and simple as it should be. Low-income Americans still register at a lower rate than the wealthy. 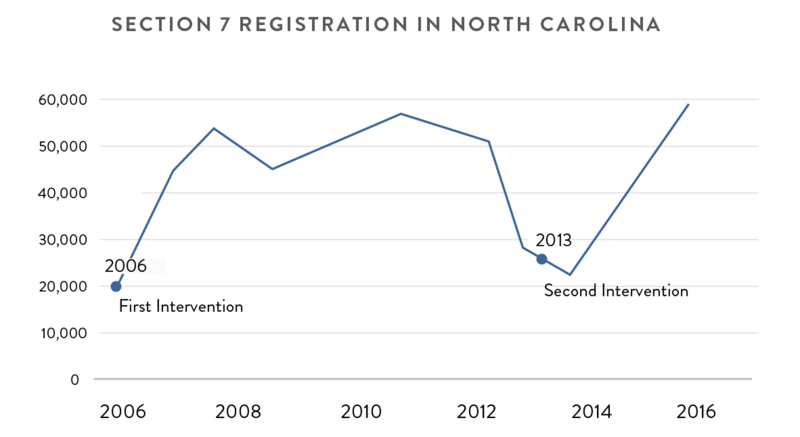 This points to inadequacies and inconsistencies in how voter registration is being offered. To encourage higher registration numbers, the National Voter Registration Act (NVRA) was passed in 1993. The NVRA sought to make registration simpler and more accessible by requiring the opportunity to register to vote be offered at Department of Motor Vehicles (Section 5) and public assistance agencies (Section 7) when participants complete applications, re-certifications and changes of address. It also implemented national standards for mail-in voter registration. Thanks to the NVRA, millions of new voters have been added to the rolls—and given the chance to make their voices heard—in the years since its enactment. The NVRA’s passage was a huge leap in the right direction. However, its full potential remains untapped. Compliance with Sections 5 and 7 varies across covered states, resulting in missed opportunities to bring millions more people into the political process. Over the last several years, Demos and partners have worked with states across the country to assess and improve compliance with the voter registration requirements. Through collaboration with local election administrators, advocacy, and, when necessary, litigation, Demos has significantly increased the number of registered voters in these states. By focusing on compliance at public assistance offices, we have played a particularly important role in diminishing the gap in registration rates between low-income and wealthy populations. “Both of my sons are registered voters now after receiving the voter registration form from the food stamp office in my reapplication envelope. Now our house is a 3-voting household thanks to this program. It only took a few moments to fill out the application and within a month they had their voter cards. They were both able to vote in our last election and will be able to vote in the upcoming election. It was a proud day for me to walk in with my oldest son to vote in the presidential election. And he was pretty pumped up about it, too." Every time you cast a ballot, you affirm your right to participate and be represented in our government. Let’s make this National Voter Registration Day count by helping fulfill the vision of all of those who fought hard for the National Voter Registration Act. Please go register today!